Successfully Added iPhone and iPod Car Charger and Holder + FM Transmitter to your Shopping Cart. Drive in style with the iPhone and iPod vehicle holder & charger with FM transmitter. Finally, here is a convenient way to drive while listening to music from your iPhone or iPod. The iPhone and iPod Car Holder and Charger also rotates 180 degrees which is very convenient for GPS navigation from your iPhone. This iPhone and iPod vehicle holder and charger with USB & FM transmitter meet the needs of all iPod, iPhone and MP3 users. The iPhone and iPod car holder and charger with USB & FM transmitter can also be used with your MP3, MP4, MP5 and MP6 players by connecting your media players into the built in USB port on the iPhone and iPod car holder and charger with FM transmitter. 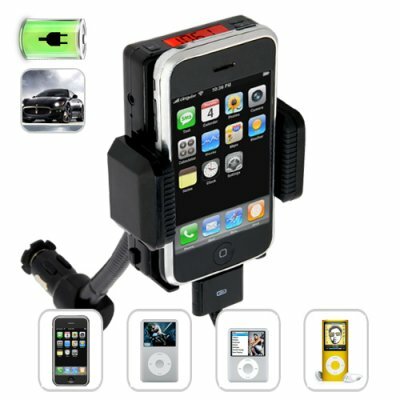 The great feature about this iPhone and iPod car holder and charger with USB & FM Transmitter is the FM transmitter function, just adjust the FM frequency from the iPhone & iPod charger/modulator to match that of your car's FM radio frequency, and then enjoy listening to music straight from your iPhone or iPod. You will also be able to take calls hands free and listen to your caller through your car's stereo system, that way you don’t have to get distracted while driving. This hands-free iPhone & iPod FM transmitter is designed with the user in mind for comfort and easy access of their iPhone or iPod apps. This iPhone and iPod car holder and charger with USB & FM Transmitter is in stock now and available at a factory direct wholesale price from the leading providers of consumer factory direct wholesale electronics, Chinavasion. Compatible with iPhone, iPod MP3 ... more! Does it matter what make or model my car is, in order for this iPhone and iPod car holder and charger with USB & FM transmitter to work in it? The make or model of you vehicle does not matter at all, this iPhone and iPod car holder and charger with USB & FM transmitter works with all car makes and models, all you have to do is insert this iPhone and iPod car holder and charger into your cars cigarette charger output. Does this iPhone and iPod car holder and charger with USB & FM transmitter come with a MIC for hands free calling? on 2010-06-04 11:29:58 can this be real? I keep waiting for this to break, it is too good to be true. It charges my phone and plays music through an FM signal on my radio, for $12.00???? Unbelievable. I also use it to hold the iPhone as a GPS while it gets power from the dash, way better than having it sit on the console and roll around.